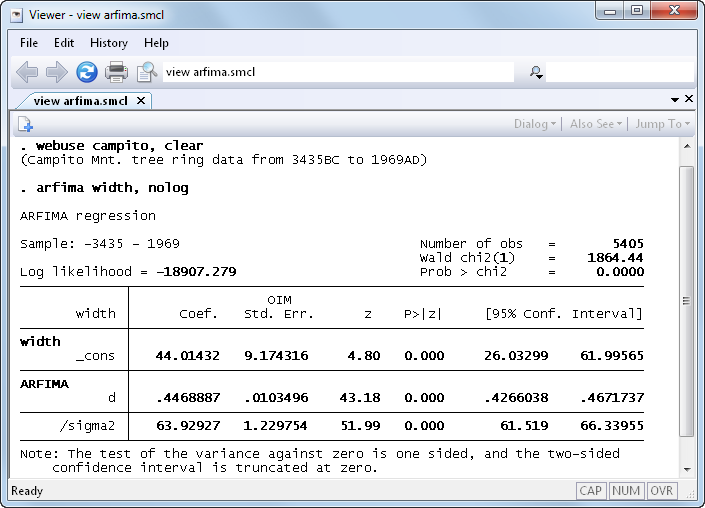 ARFIMA was introduced in Stata 12. See the latest version of ARFIMA. See all of Stata's time-series features. See the new features in Stata 15. ARFIMA stands for AutoRegressive Fractionally Integrated Moving Average. Stata’s new arfima command fits ARFIMA models. ARFIMA concerns long-memory processes. Long-memory processes are stationary processes whose autocorrelation functions decay slowly. The ARFIMA model provides a parsimonious parameterization of long-memory processes that nests the ARMA (autoregressive moving-average) model, which is widely used for short-memory processes. Long-memory processes can be obtained by fractionally integrating short-memory processes. The ARFIMA model does that. The ARFIMA model also generalizes the ARIMA model by allowing for fractional degrees of integration. Below we analyze yearly data on the widths of the rings of a tree. This one tree survived 5,000 years! In any case, larger widths represent good years for the tree and narrower widths represent harsh years. Below we estimate the parameters of an ARFIMA model with the fractional difference parameter and a constant. With only those parameters, we will account for the long memory of the process. For a complete list of what’s new in time-series analysis, click here.